Thermography Blog: Preventive Thermal Breast Scanning – How Does It Work? Preventive Thermal Breast Scanning: How Does it Work? A risk-free-method to monitor breast health is thermal scanning, which can indicate risk level for breast cancer. Breast Cancer is the most commonly diagnosed cancer affecting American women; second only to skin cancer, and about 1 out of every 8 women in the US will be diagnosed with invasive breast cancer in her lifetime, despite advances in research and public awareness. Worldwide, breast cancer is the most common cancer affecting women. Survival rates vary, but have improved, in part due to newer preventive breast screening procedures that can lead to early diagnosis and treatment. 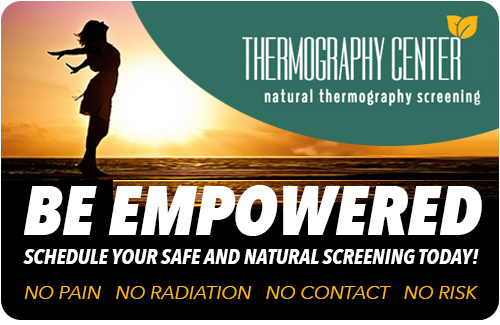 Thermography is a natural breast screening tool which can be used to monitor breast health with the goal of identifying problems at an early stage before more advanced pathology is able to develop. Thermography is conducted using a high-resolution digital thermal imaging camera and looks at heat patterns to indicate risk of developing breast cancer. The thermographic images are sent to a Board Certified Radiologist for interpretation and the results are classified according one of six categories of risk: Within normal limits, At low risk, At some risk, At increased risk, At high risk, or Previously confirmed malignancy. The patient’s health history, previous scans and other data, and current concerns and symptoms are taken into account and discussed in the findings when interpreting the images.